I have decided to change the name of this site to Jillian’s Baking instead of Jillian’s Cookies, since I have somewhat expanded my recipes to include things that are baked but not cookies. From my dinner-with-parents last week, I had a bunch of leftover spinach. So, I decided to make lasagne. 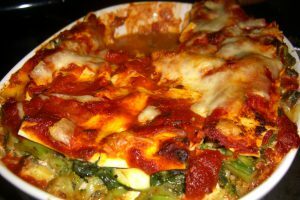 I am not really a big meat eater, especially of ground meat, and I thought that making a tasty vegetable lasagne would be better than meat, especially since I could then take advantage of the lovely fall harvest, which is in full swing right now. I made 1/3 of mine with a limited amount of cheese for the lactose intolerant among us. Also, I kind of made this up as I went along but it definitely turned out alright. 1. Bring a pot of water to a boil and immerse the spinach leaves for 2-3 minutes Drain well and pat dry. 2. Heat 3 tbs olive oil in a saute pan. Place the garlic in the pan and saute for 2 mins. Add the vegetables, season with salt and pepper to taste, and saute for 6-8 mins, until everything is slighly softened and well-seasoned. 3. Preheat oven to 350oF. Stir egg with ricotta, Parmesan cheese, 2 c of the shredded mozzarella, and 1/4 c of the tomato sauce in a medium bowl. 4. In a 9″x13″x2″ pan, spread 1 c sauce to cover the bottom. Layer 4 lasagne sheets, slightly overlapping. Spread half of the ricotta mixture, then spoon half of the vegetables over that and sprinkle 1 c of the mozzarella. Spread 1 1/2 c tomato sauce. Repeat layering lasagne sheets, remaining ricotta mixture, remaining vegetables, some mozzarella and 1 1/2 c sauce. The final layer will have 4 lasagne sheets, the remaining sauce and the remaining mozzarella. 5. Bake approximately 40-50 minutes, until bubbly and cheese on top is browned. Let stand 10-15 minutes before cutting.